As I’ve joked in conclusion of my recent post on sampling, it looks like these days I buy even samples only after sniffing them. 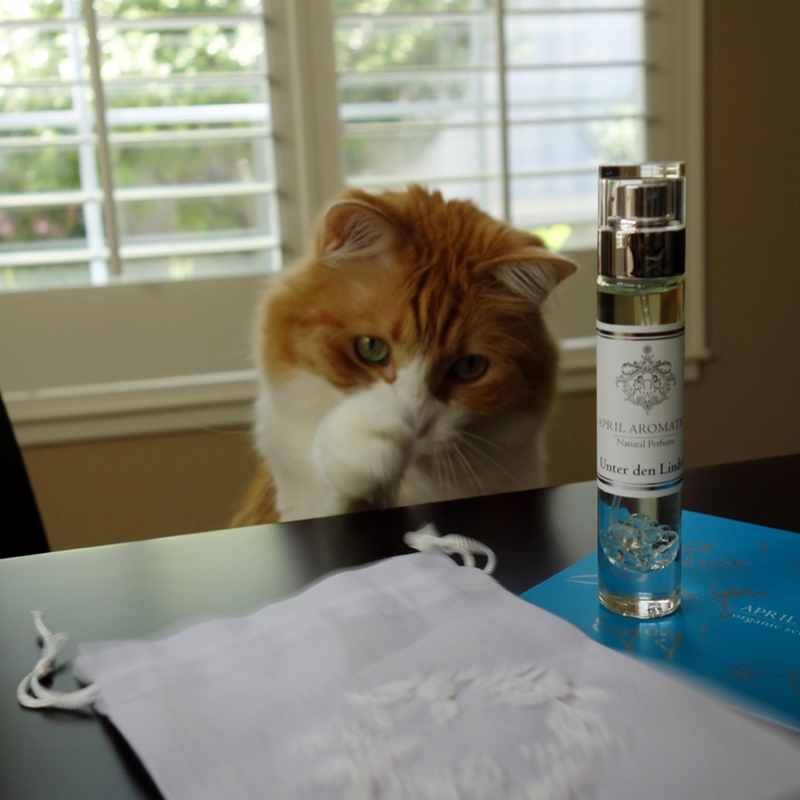 My first visit to Tigerlily Perfumery in San Francisco several years ago wasn’t a success, so for a long time I didn’t want to go there even though they were holding some interesting events and carrying perfume lines that aren’t available around here anywhere else. But as time passed, the negative impression had faded away, and I decided to give it another try. 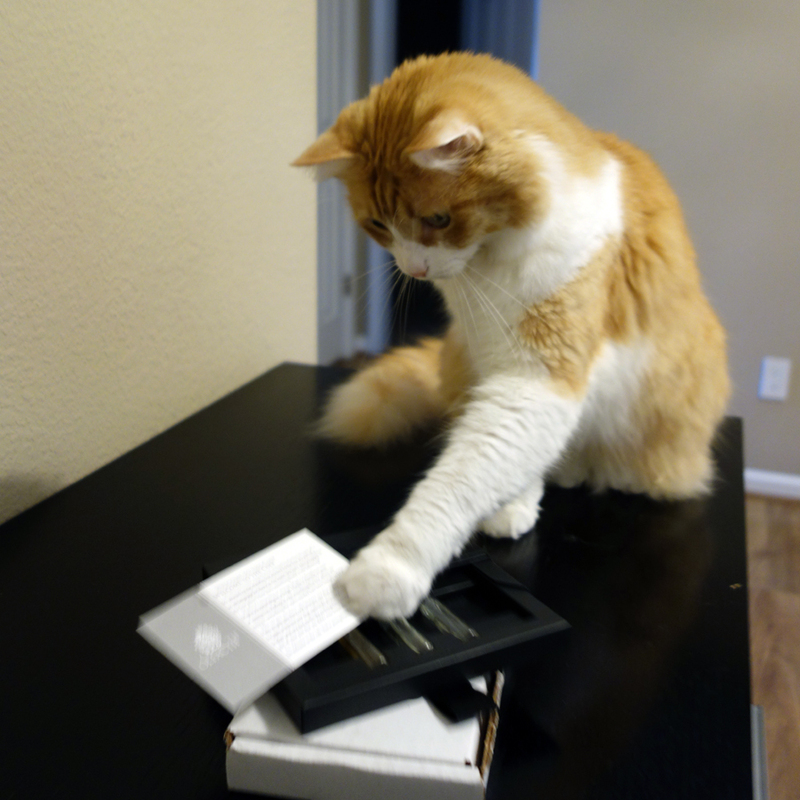 This time my visit went really well, I spent probably 30 minutes sniffing everything I wanted to try. There were a couple of things that I especially liked about the store. 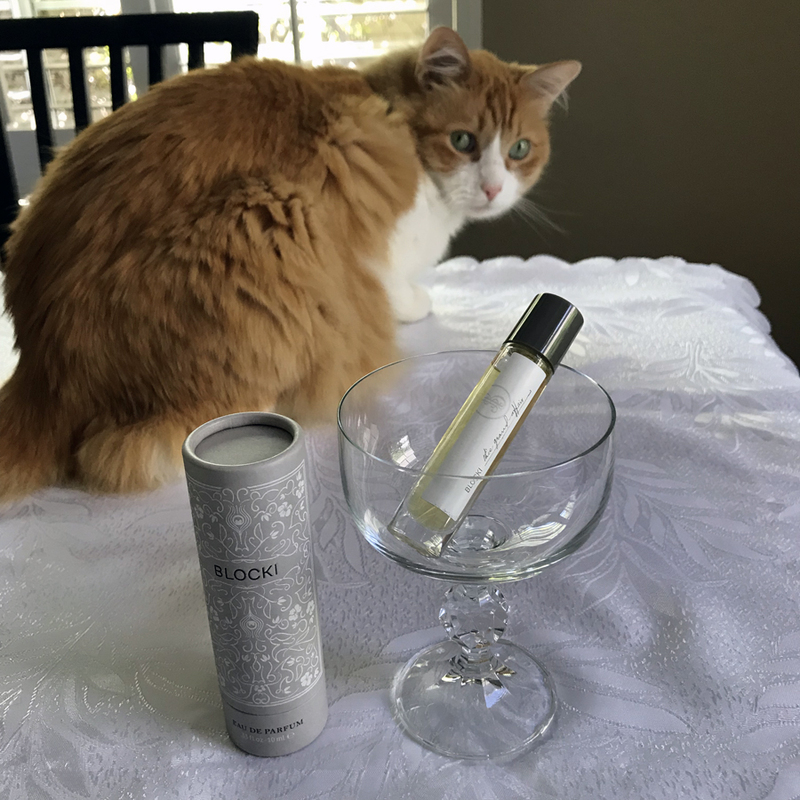 First, in addition to “hard to find” niche brands, such as Neela Vermeire Creations, Papillon Artisan Perfumes or Tauer Perfumes, they carry local (SF Bay Area and Californian) brands – Ineke, Parfums DelRae, Bruno Fazzolari, Yosh and others. Then, people who work there are not push-y and allow customers to browse/sniff all they want without insisting on helping them but being close in case help is needed. 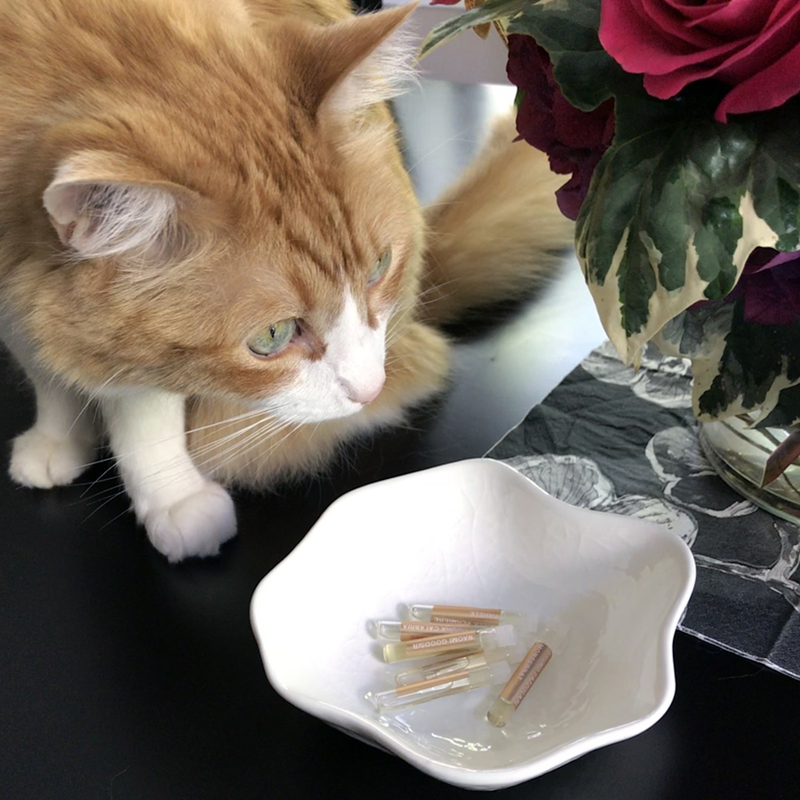 Finally, as I found out, Tigerlily offers at the store three free 1 ml dab samples of your choice. After that you can buy other samples at $3 per sample. I really like this approach: selling samples isn’t their business; they cover costs while providing customers a chance to try perfumes at home and, hopefully, come back for more. After smelling about 40 perfumes from the nozzle first and then some of them on blotters, I ended up buying 3 samples in addition to 3 free ones to try them on skin at home. 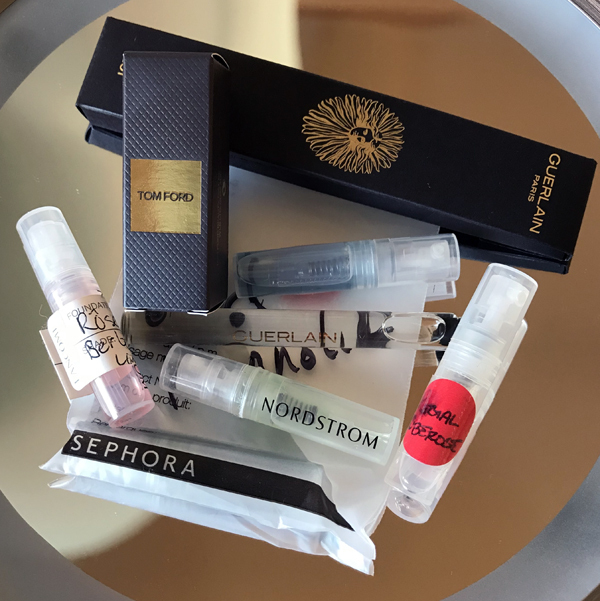 Even with the cost of parking in the area, price per sample turned out to be much better than it would have been had I bought them online – especially since I knew already that I didn’t dislike those perfumes. Today I’ll talk about three of the six. I’ve previously smelled Tauerville Vanilla Flash but since I’m not a vanilla fan in general, I haven’t tried it on skin. This time I smelled it on paper again and decided that I had to properly test it. I have a feeling that I’m the last one to try it and everybody else has done it by now. So I would be very curious to hear whether you’ve tried Vanilla Flash. I like that it is not too sweet. I enjoy booziness of vanilla. But it feels a little too intense (like most of Tauer’s perfumes), I think I would have preferred it in the form of body oil, so probably I won’t go for a bottle – even though the price is more than reasonable. But if anyone has 5 ml decant to swap with me, I would love to wear it a couple of times. I wasn’t completely new to Nishane Ambra Calabria as well: Lucas who did a very nice review for this perfume last year graciously sent me his sample. I tried and liked it but then something else distracted me and I forgot about it. When I smelled it again at Twisted Lily, I decided that I wanted to give it another try. It is such unusual perfume! I don’t think I’ve smelled before such combination: very strong citrus developing into warm amber. I think it’s the most summery amber I’ve ever come across. And since I like ambers and do not have enough weather suitable for heavy heaters in my collection, I could see myself wearing Ambra Calabria. But why 50 ml?! Especially since they position it as extrait. I would love to be able to buy 10-15 ml bottle from the brand but not 50 ml. BLOCKI brand actually was the main reason I decided to go to Tiger Lily: a week earlier they had there a presentation of their new perfume – SANROVIA, which I was curious to try since I really liked and recently bought this grand affair (pictures below are those that I couldn’t include in that post 4 months ago since it had arrived only after I published it). I couldn’t make it to the event but decided to go the next week. Unfortunately, SANROVIA didn’t pass even paper test. I might go back and try it again one day but this time I decided to skip it. Instead, I got their earlier released perfume – in every season. I tried to like it. I gave it all possible benefits of the doubt. I don’t know what to say: it is not nasty or unpleasant, but it is neither interesting nor even pleasant nor beautiful. It gets a little better a couple of hour into wearing but frankly speaking I would go for many of the mass-market perfumes before I would think of wearing in every season. In any season. A holiday in the middle of the week is a strange thing. We haven’t planned anything special for this year’s 4th of July, so I had a little extra time on my hands, and I decided to share some news and deals that you might have missed. I might do it periodically, hence the “Episode 1” designation. 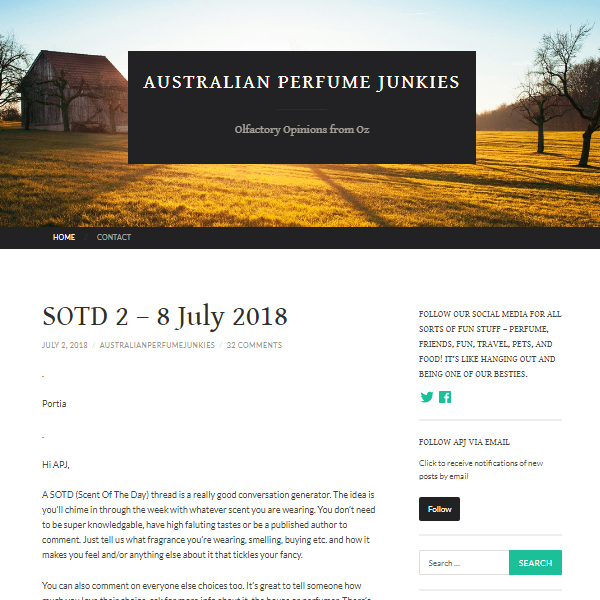 In case you missed the news, Australian Perfume Junkies blog is back after almost a three-month hiatus. Hopefully, issues with hackers are resolved for good, and soon it will be accessible from the regular address (http://australianperfumejunkies.com/) but for now it can be reached at https://australianperfumejunkiescom.wordpress.com/. Also please note that you need to re-follow the blog if you want to be getting e-mail notifications. A couple of days ago Lucas celebrated 6th anniversary of his blog – The Chemist in the Bottle – answering interview questions from one of his blog’s loyal readers Jillie. 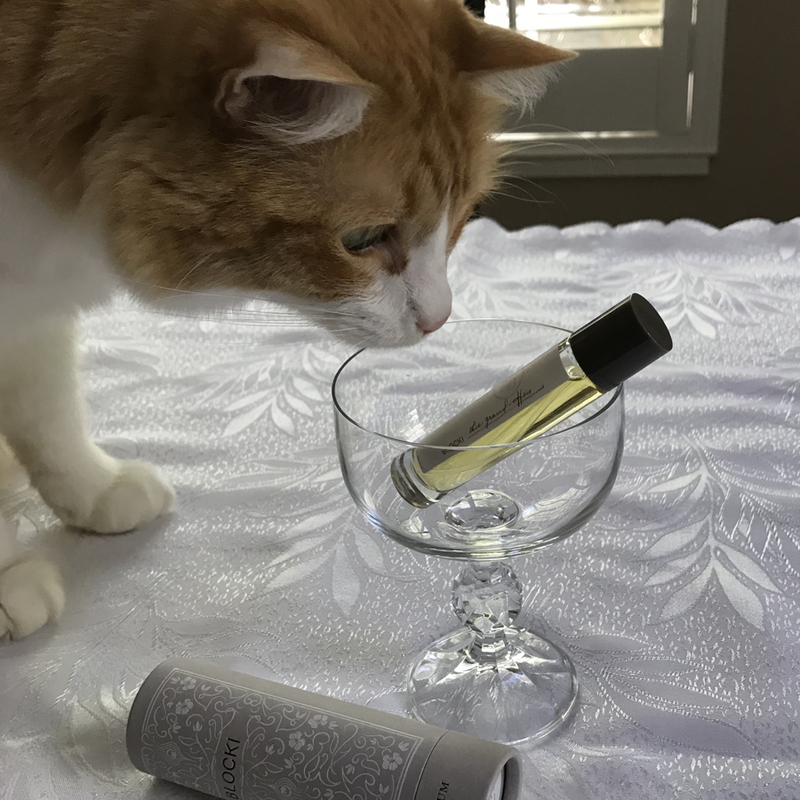 Go read it to find out what a fragrance evaluator job involves, whether Lucas plans to create his own perfume brand, and just to say “Congratulations” on this rather significant milestone. 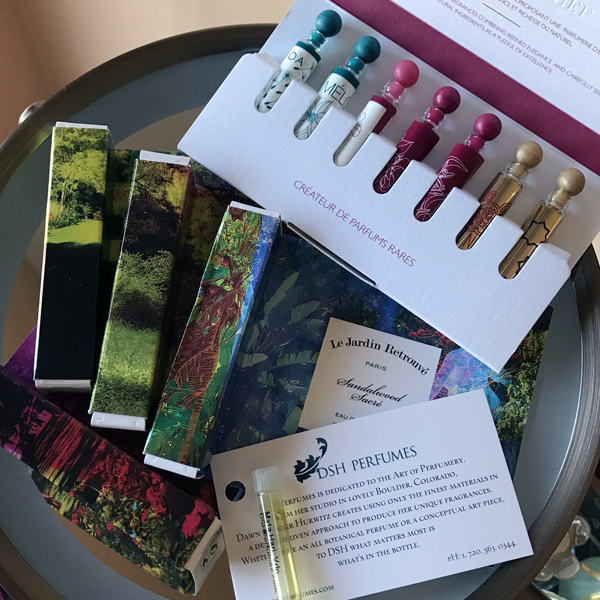 If you followed Le Jardin Retrouvé’s Perfume Revival Project 2018, you know that the winning “dot” was the black one – Oriental Sans Souci. This one and the two out of the remaining three will be released as a limited edition of 200 bottles (50 ml) and can be pre-ordered here until the end of July and will be delivered in October. I have not tried any of these but I refer you to Cynthia’s (The Fragrant Journey) post about it. 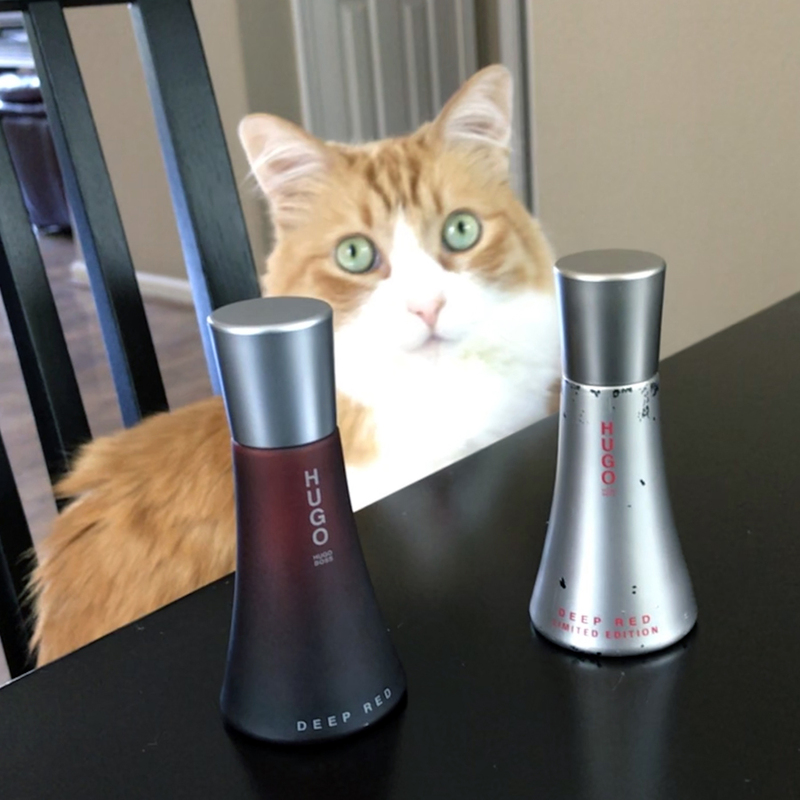 Picture of Rusty is a bonus: it’s not special enough to go on its own into the “From the Cutting Room Floor” series, but I decided to share with you a picture of Rusty with Sonoma Scent Studio’s Bee’s Bliss that I wore today to celebrate the 4th of July. 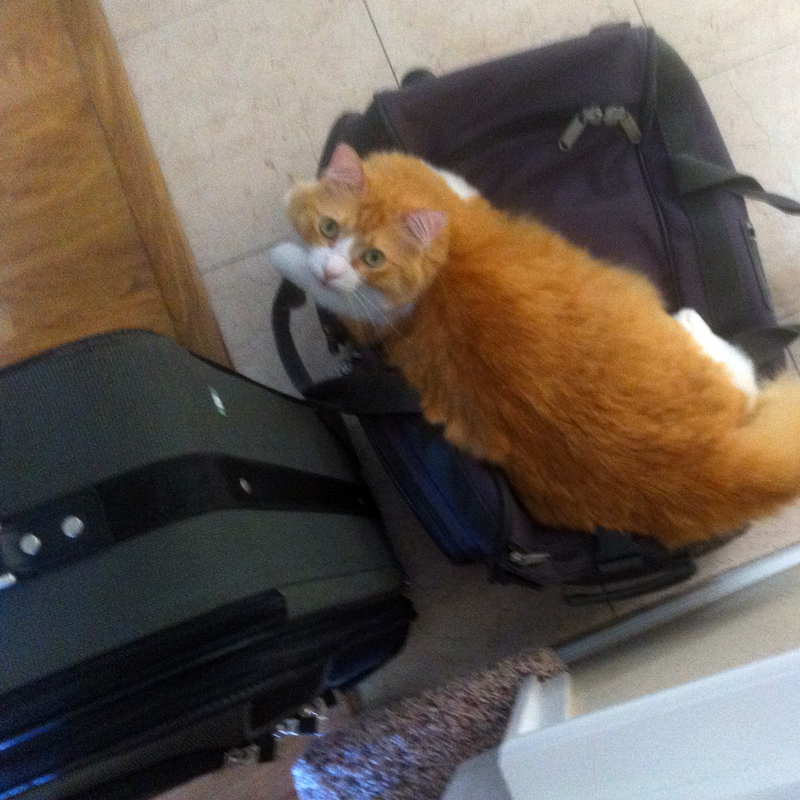 Have you recently come any news, deals or cat pictures to share? Being a fan of floral perfumes, I like many flowers and blossoms and enjoy many perfumes in that genre. But if by some cruel turn of events I were to choose just a single floral note for my perfumes, it would probably be linden. Partially it is the scent itself, partially an emotional response to memories associated with it, but linden holds a special place in my mental olfactory catalog. Years ago I did a couple of posts on the topic (In the Search of the Perfect Linden linked to above and Take 2). 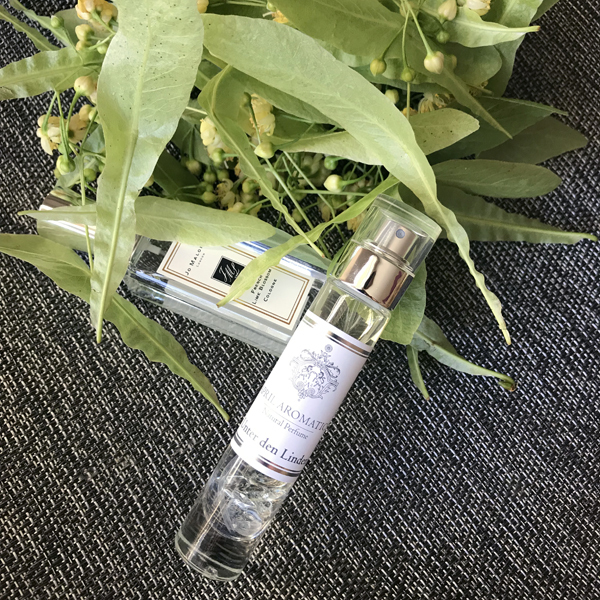 I can’t say that I found an ultimate linden perfume then or since: real tree in full bloom smells so much better than any perfume I’ve ever tried, but until anything even more realistic is created, I have two perfumes that come close, about which I want to remind you and warn you. French Lime Blossom from Jo Malone is one of the oldest perfumes in my collection that I still love and wear. 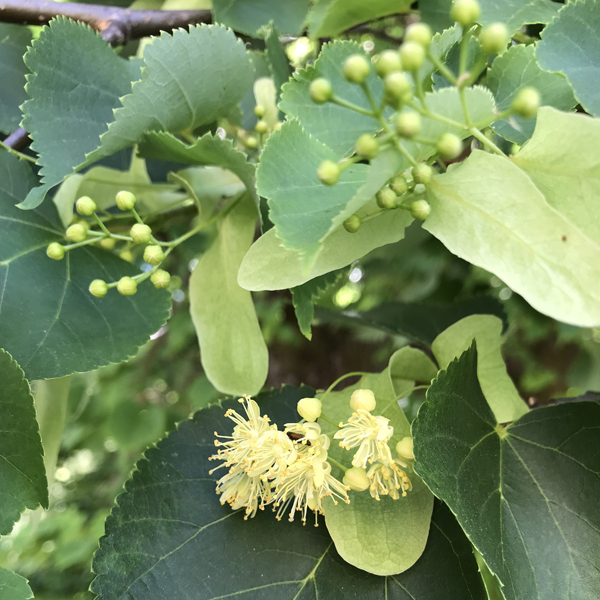 People who are not familiar with the smell of linden blossom often talk about citrus component and sweetness from the (provided by Fragrantica but not mentioned by the brand) beeswax note while both of the facets are characteristic of the true linden blossom. I was very sad to learn that French Lime Blossom has been discontinued (a kind reader informed me and then an SA at Heathrow airport Jo Malone duty-free store confirmed the news). You can still buy a bottle online from large department stores’ sites but it is the remaining stock. Jo Malone website does not have it any longer, so once gone I doubt it’ll ever be resurrected: it’s not one of those anemic “blossoms” they’ve produced in the recent years and keep redressing in pretty bottles. I’ve got a back-up bottle of French Lime Blossom but I would have been much happier knowing that it is still in production. It’s a very pretty perfume and I take back my original impression that Unter den Linden smelled like a more lemon-y version on one of my favorites Jo Malone’s French Lime Blossom. Unter den Linden is lighter, more refined and blended more seamlessly than French Lime Blossom (I still like the latter though). 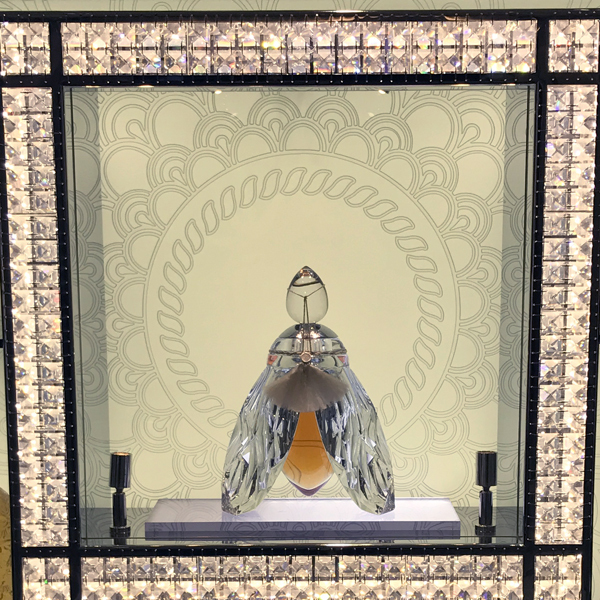 What makes me unhappy is the price: however beautiful, this perfume isn’t unique enough or using really expensive and rare ingredients to justify to me $7/ml price for EdP. But if it weren’t for that I’d love to add a bottle of Unter den Linden to my collection. I still might. And I did: once April Aromatics started offering a smaller bottle (15 ml), I bought one a year ago. It was the first all-natural perfume in my collection. Unter den Linden has a recognizable linden note but I wish it had a bit more of that sweet floral component of the real blossom. 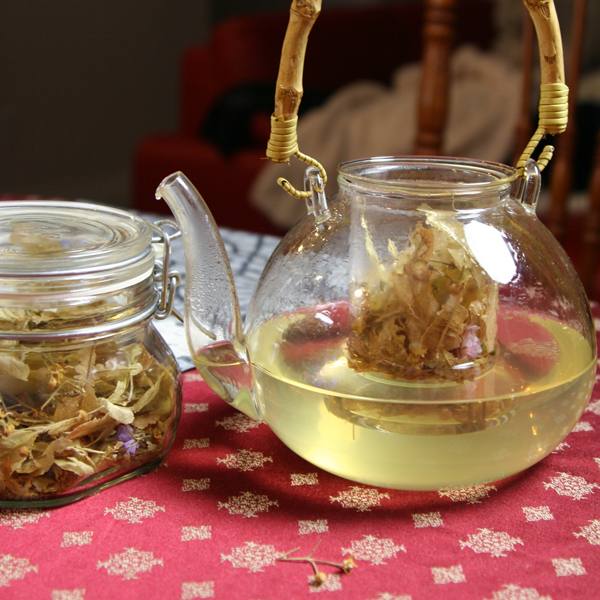 I also have a concern that all-natural perfumes might not be for me even if I like them because even with proper storage (cool closet, out of light), just a year after I bought it, I can smell changes in Under den Linden: there is a hint of dry linden blossom – the one that is used for tea. I do not dislike it but I’m afraid it’s a sign that my perfume turns, and I do not wear it often enough. I guess back-up bottles of Unter den Linden would be out of question, no matter what. Interestingly, the remaining French Lime Blossom in my 10 years old bottle is still fine. So if you are, like me, mostly used to mixed media perfumes, go check on anything all-natural you might have and start enjoying those perfumes before it’s too late. Skin chemistry is a debatable topic: purists will explain that there is absolutely no merit to using that term in reference to perfume-skin interaction; while numerous perfume lovers constantly refer to “my perfume-eating (or loving) skin,” complain about some notes or perfumes being nasty on their skin, or tell how great perfume in question smells on somebody else. I might have listened to those who object to that definition had we been talking about a scientific publication or a presentation for the industry symposium. But “skin chemistry” is a good enough label to describe in layman’s terms the complex interactions perfumes have with our “soft outer tissue.” Our skin type (oily/dry), body temperature, foods we eat, products we use during and after shower, stress level, how well we slept and maybe even our clothes choice – all that can seriously affect how perfumes smell and develop on our skin, and I don’t think it really matters what is the exact nature of those differences. Every time I read about perfume something that seriously contradicts my experience with it, I start wondering if it’s my nose or my skin to blame. I know that with different ingredients it might be either, but I had at least one experience when the “skin chemistry” explanation seems to be the most fitting. – You smell great! What are you wearing? It would happen in some variation again and again between any two of us, in any direction. 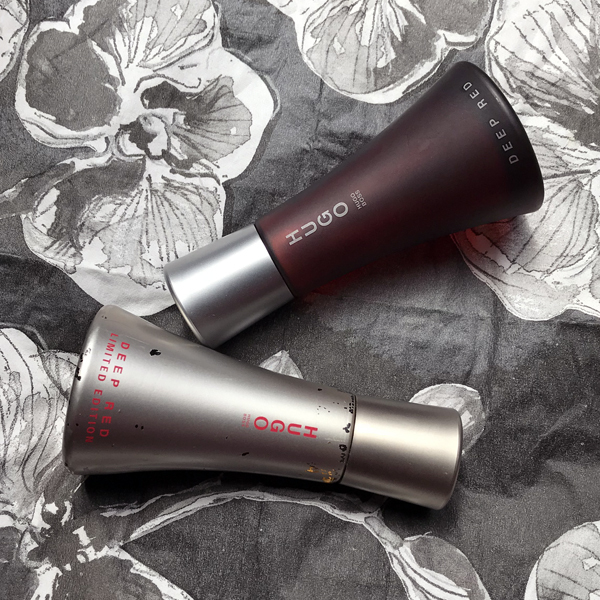 We all liked Deep Red – both on ourselves and on each other, but we could never recognize it “in the wild.” From my side, I can tell that it didn’t smell even familiar – the way when you know that you smelled it before but cannot pinpoint what it was. Not only didn’t it smell on them like I it did on my skin, I couldn’t even tell that they both were wearing the same perfume. And back then neither my co-workers nor I had dozens of perfumes to wear or hundreds of samples. Eventually, I started guessing that it was that perfume just by recognizing the pattern of my reaction (“I like it very much, I do not know what it is but it smells really good on J… Oh, wait! It must be Deep Red again”). Deep Red is one of a few mainstream perfumes that survived in my collection from the pre-rabbit-hole days. It is much simpler than most of my current favorites but I still like and wear it. Seven years after I mentioned it first in my post In Search for the Perfect Pear, I finished my third bottle of it (the red one on the picture above) and would have been thinking about getting the next one (hoping to find the older stock – just in case it has been reformulated beyond recognition in the recent years; I bet it was), but Vanessa (Bonkers about Perfume) had rehomed with me her partial bottle of Deep Red (limited edition, in a silver bottle). So I’m probably all set for the next seven years. 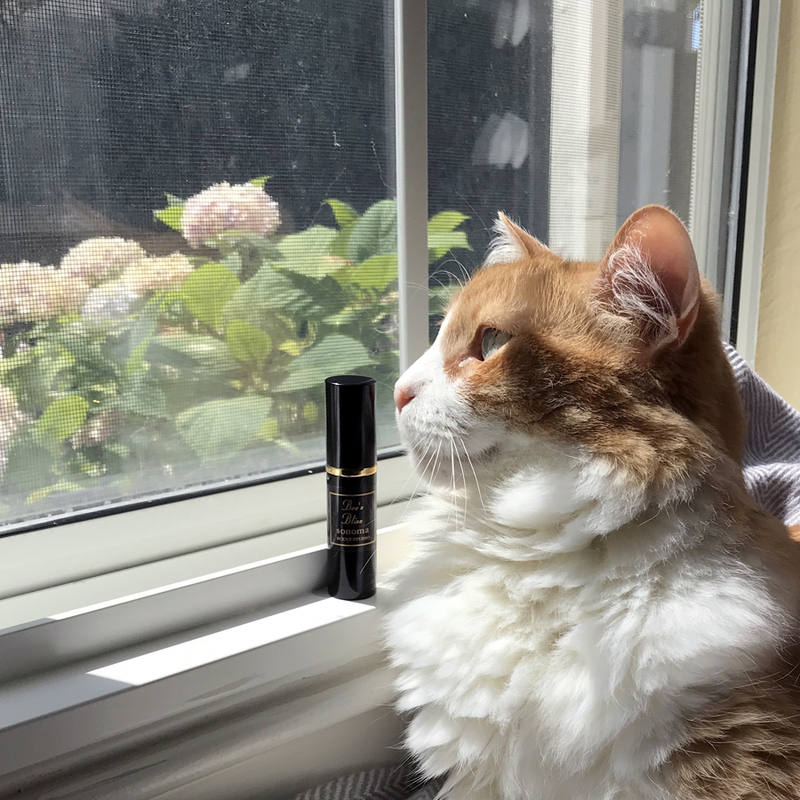 Just a reminder: You still have until 11:59 PM PST today, May 20, 2018, to enter hajusuuri’s giveaway for samples from the recent Sniffapalooza. As baby boomers grow older, the volume of unwanted keepsakes and family heirlooms is poised to grow — along with the number of delicate conversations about what to do with them. […] As […] older adults start moving to smaller dwellings, assisted living facilities or retirement homes, they and their kin will have to part with household possessions that the heirs simply don’t want. This reminded me of how things were in my childhood. I suspect that life was better in large cities than in more provincial towns or rural areas, but I can speak only about what I saw or experienced: I lived in a large city. There wasn’t poverty around: you could buy food, clothes and other products one needed for the day-to-day life. But almost everything was not of the best quality, and even that you had to “procure” – spending hours in lines to buy something, moving from one store to another in hope to catch a delivery (of very limited quantities of goods), or “knowing” people who could “get” something for you – either in exchange for favors or for extra money. Demand always exceeded supply, so everybody was on a constant hunt for something. Official prices for small items weren’t extremely high but anything bigger or better required months or even years of savings. Because of all that, most clothes and household items were used for decades. And even when our parents or grandparents managed to obtain something newer and better, they would usually save that for special occasions or a rainy day. 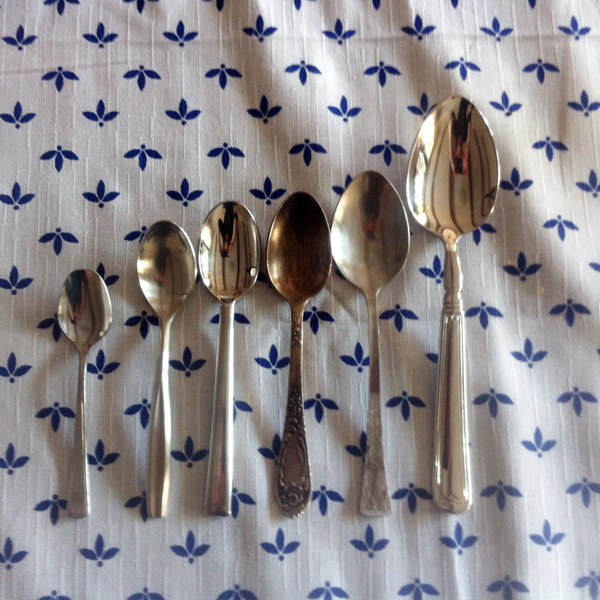 Nicer china, stemware and flatware were used 2-3 times a year for very special occasions with guests while in everyday life families kept using odd items from previous decades – chipped, discolored, missing parts and their set “relatives” but still perfectly usable. But at least those “special” sets got some use. It was worse when it came to towels and bed linens: while old sets were used until you could see through them (and sometimes beyond that), the new ones stayed in dressers for decades waiting for weddings, funerals or some very important guests. So usually it was the next generation who would get to use something that stayed new for a decade or two. By the time I grew up, the old life came to a sudden halt: within one year inflation ate up our parents’ life savings; fresh out of university and working for a private company, I was making 5 times more than highly educated and experienced people of my parents’ generation who worked for government-owned enterprises; and goods that flooded the market were … awful if you look back from today but so much better than everything that the older generation was saving carefully hoping to pass onto us one day. We moved to the U.S. with two suitcases leaving behind most of the things we got passed on from a couple of generations. Many years later, I have “dress up” clothes but my daily outfits are nice as well (because I can afford it, which wasn’t the case for many people back in my childhood years). I have special dinnerware but I try to use it more often – for evenings with friends or even for more special dinners just with my vSO. I also have many “special occasions” perfumes. A couple of them were designated as such: since I love them very much, I prefer to wear them for celebrations. But I’m talking not about these few. When I started my current job, I became more perfume-conscious because in a smaller office I have a couple of people who [think they] have sensitivity to perfumes. I started using less and lighter sprays but would still get (very polite) complaints from time to time. And recently I realized that I’ve changed not only my office environment but also my perfume habits and wardrobe. For years I had “daywear” (aka “office friendly”) and “dress-up” perfumes, and I wore those according to their designations. Daywear perfumes were light, pleasant and non-intrusive while perfumes that I wore away from the office were much more dramatic. But over time I accumulated too many perfumes that I put into that latter category, since those perfumes attract me the most. And when a large part of your perfume wardrobe consists of not-so-office-friendly perfumes, you end up wearing them more and more often. So, if to think about it, it’s surprising that co-workers do not object more often. 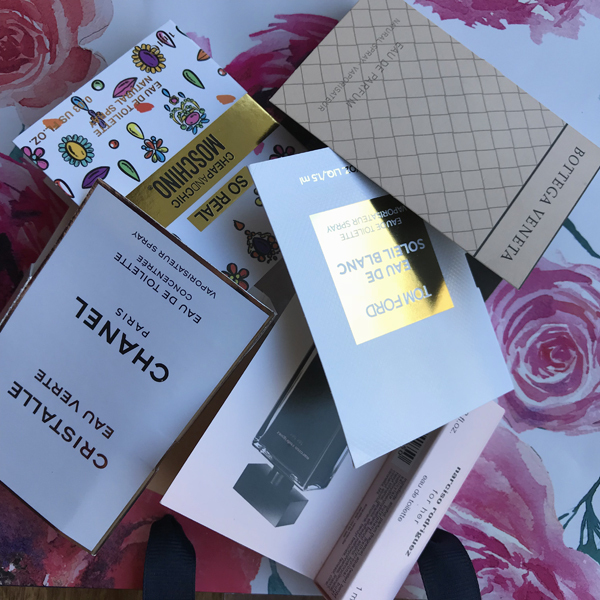 A year or so into my trip down the rabbit hole I was concerned that my testing got out of control pushing me to test new perfumes instead of wearing those that I already had. Back then I made a resolution to wear my favorite perfumes at least three times a week. With the collection growing, I quickly came to the schedule where I would wear perfumes from my collection during work days reserving evening and weekends to testing. But now, I think, I’m ready to the next step: I decided that I will be wearing numerous “safe-for-work” perfumes to the office and will make a conscious attempt to wear my “special” perfumes in evenings and on weekends, even if I’m stuck at home doing mundane chores. What special things do you own that could use … some use? Traditionally, before a concept of unisex perfumes appeared, or the notion that everyone can wear what they like re-emerged, perfumes were subdivided into masculine and feminine groups. In my native language, in the past, you would have never called creations for men anything other than “cologne”; while their feminine counterparts were called “parfum” (those were pre-spray-bottle times, which, as I suspect, in that country lasted longer than in the USA or some European countries). Surprisingly, soaps – in the form we had them back then (I’ve previously shared some insights into experiences of my generation in older days so I won’t repeat it) – were strictly unisex before we even knew that term. There were some special “baby” soaps but everything else that I remember from my childhood was sexless. And even when later we were getting some coveted “imported” soaps – Palmolive or Camay – they were never thought of as feminine, and the most macho men had no issues using those fragrant soaps. 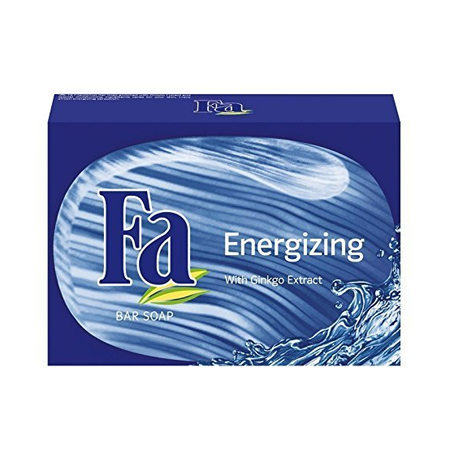 When I discovered soap for men (a German company Schwarzkopf & Henkel in 90s came up with the idea of targeting men with their products), a dark navy box with the inconspicuous name “Fa for men,” it was revolutionary! I loved that soap and bought it more than once, even though it was relatively expensive. It was marbled blue and white, and smelled wonderful though I wouldn’t be able to tell what it smelled of. They were probably before their time, so in a while it transformed into Fa Sport for Men first, then into something else (it had happened after I moved to the US, so I don’t know/remember what it was in between and cannot find since it was before mass Internet), and then into Far Energizing (the picture above shows the most recent reincarnation: both the box and the soap of the original one were darker but this is the closest I could find). 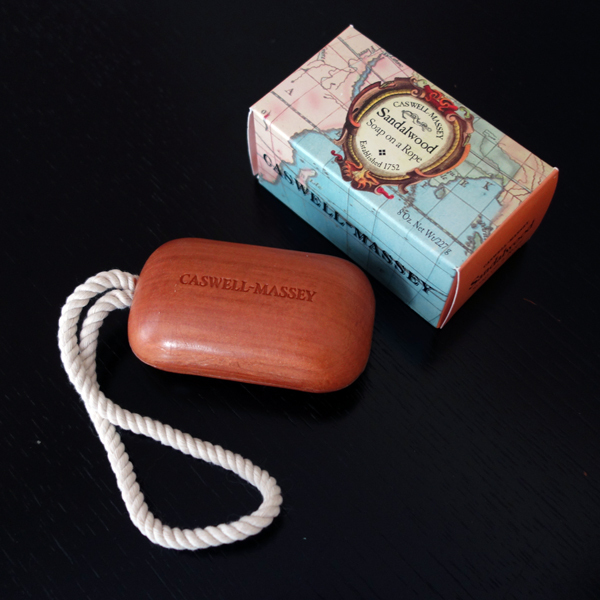 In the US there were enough local mass-marker brands, so I completely forgot about that European brand… until many years later I smelled Caswell-Massey’s Sandalwood Soap on a Rope. When I blind bought the first bar, I didn’t know what to expect from the scent: I was looking for soap on a rope to hang and use in the shower and liked how this one looked on the picture. Years apart, I cannot say with any certainty that Sandalwood and Fa for Men soaps smelled identical but in my scent memory they were very similar, and that made me predisposed to like Sandalwood even before I started using it. If you’re interested, you can read more about the brand’s history from the link above, I’ll just mention that as of 2017 it was re-launched (still as a privately owned company), and they’ve re-released their perfumes and colognes line (with some “updated formula” – whatever it means). I bought my second Sandalwood bar as a gift to myself and my vSO for Christmas 2016 – and for almost 16 months since then he’s been using it exclusively and I would rotate between this soap and several shower gels. And it still has probably another month of use in it! Do you know Caswell-Massey brand? Have you tried any of their products – be that soaps, perfumes or hand creams? 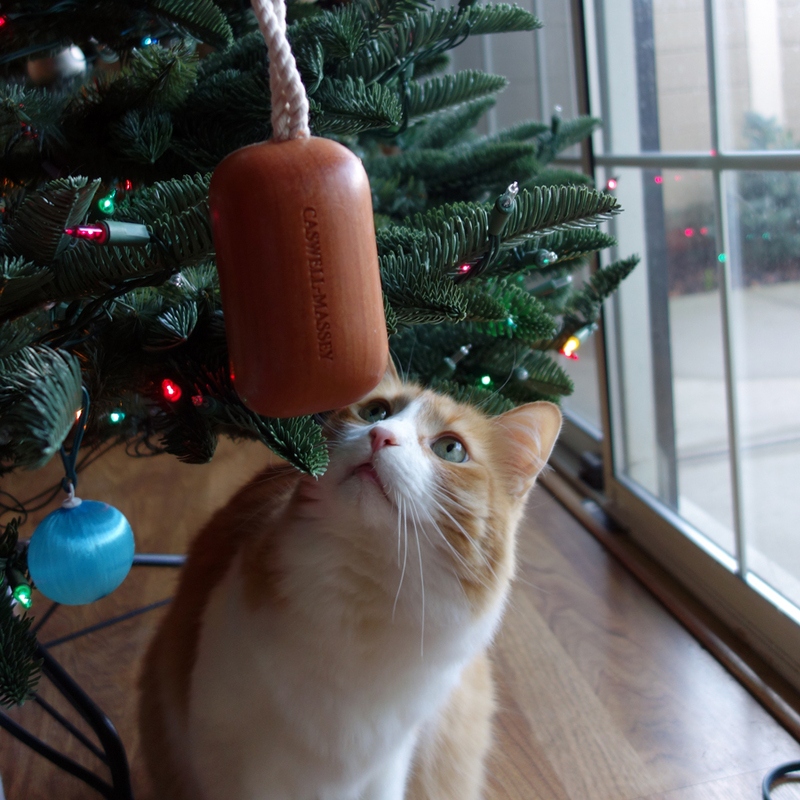 Have you ever used any soap on a rope?